As an Australian, I have chosen to highlight an Australian national day. Friday 28 August is Daffodil Day - something very close to my heart. What is Daffodil Day? It's an annual fund-raising event run by the Cancer Council of Australia when we buy daffodils or daffodil pins to help support vital cancer research, develop cancer prevention programs, and provide patient support (like Cancer Council 13 11 20) for the tens of thousands of Australian lives affected by cancer. Daffodil Day is a day when we can all show we care about beating cancer. The Daffodil is a hardy annual flower that pushes its way through the frozen earth after a long winter to herald the return of spring, new life, vitality and growth - it symbolises rebirth and new beginnings. So it was chosen by the Cancer Counil to represent hope for a cancer-free future. I just love Step Cards - they're so quick, easy and effective! This style of Centre Step Card is one of my go-to folds! There are many tutorials available. The base is Mossy Meadow, layered with Hello Honey and English Garden DSP. I used the Ovals Collection Framelits to layer Mossy Meadow and Whisper White. The edge of the white oval and all the DSP is inked with Hello Honey. The ribbon is Hello Honey Quilted Cotton which I found in my stash. I'm sorry that it's retired. To make the daffodils I used the Fun Flower punch with Crushed Curry cardstock (edged with Hello Honey ink) and the 1.25" Scallop Circle punch with Pumpkin Pie cardstock with a little Pumpkin Pie button in the centre. The leaves are free cut from Garden Green cardstock. 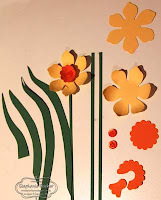 This picture of the flowers in progress is probably worth more than a thousand words in describing how I made the daffodils! Once I'd trimmed the scallop circle, I put a glue dot behind one end to stick it to the other end - this makes the daffodil trumpet. I used the bone folder on the yellow petals to add depth and then glued the trumpet and a button into the middle of the flower. Have fun with this challenge, wherever you are and whatever you choose to celebrate! 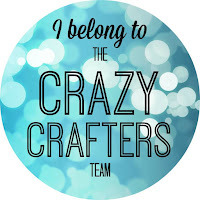 I look forward to seeing your creations over at Splitcoaststampers! 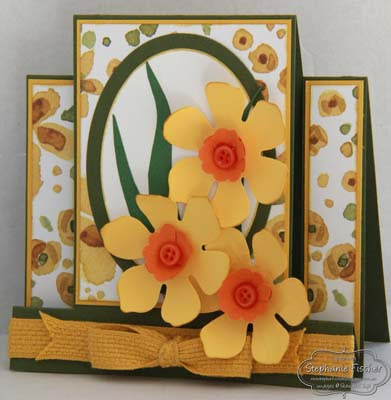 Labels: Centre Step Card, Daffodil Punch Art, English Garden DSP, Fun Flower Punch, Fun Fold, Stampin' Up!